See more objects with the tag timekeeping, time, plastic, gears, translucent, watch. This is a Watch. It was manufactured by Swatch. It is dated 1985 and we acquired it in 2017. Its medium is molded plastic, metal. It is a part of the Product Design and Decorative Arts department. 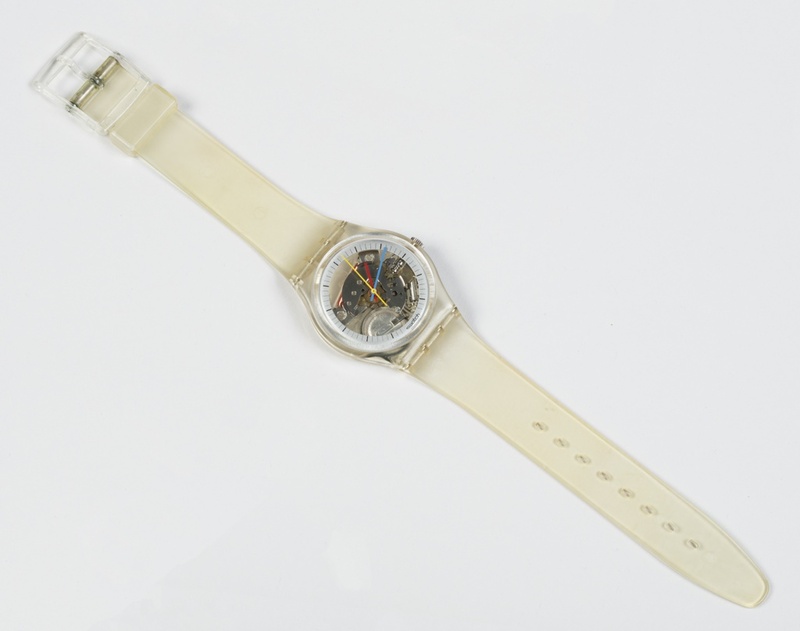 Swatch aimed to compete with the inexpensive Japanese digital and quartz watches that dominated the market in the 1980s. The name Swatch is a contraction of “second watch,” meaning not one’s primary timepiece—suggesting that customers would desire to own and even wear more than one. Swatch watches contained 51 parts, as opposed to around 100 parts in the traditional Swiss watch. Other technical and cost-saving innovations included an ultra-sonic welding process, automated assembly, and simplified gearing. It is credited Gift of Robert M. Greenberg. gold, steel (stainless), leather, glass. Gift of the Designer - Charles Davidson.